Inside Storey: What's on Your List? I'm not one of those "I need to do this before I die" kind of gals, nor am I in the "face your fears, it'll make you stronger" population, but I do acknowledge I may be in the minority. I won't be checking off "travel to India" (which belongs in both categories — I feel I should see it at some point in my life, but I'm afraid of a country that is really hot, with many exotic, mysterious bugs). That may change, however, with a new project we're cooking up. Gwen Steege, our acquiring editor for crafts and gardening books, is spending the summer away from her desk to compile a sort of "Knitters' Life List" for a book we're gestating at Storey. This was talked about in a meeting or two here and there a few months ago, and then, suddenly, it got real. We're trying to quantify what every knitter wants to do before she or he shuffles off this mortal coil. What patterns are in your "I have to knit that" notebook? Are you a Penny Straker fan, a Yankee Knitter devotee? When a new Knitty.com arrives in your in-box, do you immediately turn off all phones, televisions, and doorbells and settle in front of the computer with a cup of tea and your printer at the ready? Have you made a Sunrise Circle Jacket or a Clapotis yet? 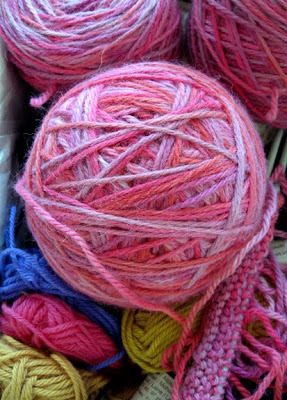 How about yarn? Are you a dyed-in-the-wool (tee-hee) Cascade 220 buyer? Do you like to take a walk on the wild side with a novelty like Artyarns sequined or beaded skeins? Confess: were you one of those scarf knitters who used the feathery stuff? It's all good, believe me. What we envision when we talk about this project is a compendium of all the stuff knitters like. Needles — what kind? Circular, double points? Addi Turbo's? KnitPicks Options? What about books — what should knitters read before, during (yes, you can), and after knitting? Where are the best yarn shops? What Web site is the most fun? This could go on and on . . . we hope the book will start many a discussion. And here's a chance for you guys out there to have a say in what will be between the covers: click here to give us your thoughts, opinions, information. You could be published! And you might win some books. You also may learn something you can check off your list, without having to go to India. I just have to say, this sounds like a fantastic book! I can't wait! Sounds interesting! The great thing about knitting is there is always more to learn so it will never be boring, yet there are good stretches of the same old, same old so it will never be too discouraging!